As long-time readers know, I am a bit of a skeptic when it comes to the taxonomic validity of the red wolf. This is particularly true when the only genome-wide analysis of wolves and coyotes in North America revealed that the creatures being conserved as red wolves were actually coyote/wolf hybrids that actually have only slightly more wolf ancestry than a typical Eastern coyote. That said, there are a lot of individuals who have devoted a lot of time and energy and entire careers on red wolf conservation, but I knew that when that study came out, it would be just a matter of time before the politics of red wolf conservation would come to a head. After all, North Carolina has just recently begun to have issues with Eastern coyotes, and although most of the coyotes in North Carolina are on the smaller side, it would be wrong to assume that there were no coyotes in North Carolina with wolf ancestry. And it’s possible, considering that coyotes with wolf ancestry have been found as far south as Virginia. Coyotes are pretty much blamed for everything that goes wrong in conservation biology in the East. If deer hunters don’t bag a huge rack of antlers, then it’s obvious that the coyotes are killing them all. The more nuanced explanation is that coyotes do take quite a few fawns every year, but unless there is a heavy snow (which doesn’t happen in Eastern North Carolina), then it’s very unlikely that the coyotes are killing all the adult deer. Fawn recruitment is an issue, so a lot of game managers, especially in the South, do coyote controls. Coyote controls involve trapping, hunting them with foxhounds, and night hunting. And it’s this night hunting of coyotes that caused the problem with the red wolf in North Carolina. Night hunting involves going out at night with an electronic call and an amber light (just to show everyone you’re not spot-lighting deer), and then using those calls, which produce howls and prey in distress sounds, to lure a coyote or two to its demise. Some people are adept howlers, and you can even buy coyote calls that produce different howls and prey in distress calls for that purpose. Coyotes can be called in the day time, but if they live where there is significant hunting pressure, they tend to stay holed up in the brush until night falls. Of course, most of the coyote hunters who do this sort of thing got into it to protect deer and other game numbers, and what usually happens is they find the coyote a much more challenging game species than any of the more typical game. Predator hunting becomes an obsession, a deep burning passion. Some of these predator hunters actually want to protect coyotes from excessive hunting, just so they will have more coyotes to hunt. And this is where red wolf recovery went south. In the five counties where red wolves roam, there has been a long legal battle over whether coyotes can be hunted in red wolf range. In May 2014, a court-ordered injunction banned coyote hunting in those five counties, but by November, the N.C. Wildlife Resources Commission created a framework that would allow some limited coyote hunting in the area. Also, if one is legally hunting coyotes, one can kill a red wolf if it is taken by accident. I should note that red wolves look a lot like Eastern coyotes. They are the same color, but they are usually somewhat larger than the coyotes typically found in North Carolina. However, I can tell you that if red wolves were released here in West Virginia, you would never be able to keep them straight. We actually do have coyotes that approach red wolf size, which kind of makes sense. After all, the coyotes of the Northeast and the Mid-Atlantic are essentially the same thing as red wolves– coyotes with some wolf ancestry. You would think that this rule alone would be enough to get red wolf conservationists screaming, but what came next is something akin to a neutron bomb going off in the red wolf community. Last week, the North Carolina Wildlife Resources commission issued two resolutions to the US Fish and Wildlife Service. The first resolution declared that because the extant red wolves in North Carolina were so heavily derived from coyote stock that there were no more pure red wolves left and that the species was extinct in the wild as of 1980– which, means that the red wolf recovery program would end under the Endangered Species Act. Once a species is declared extinct, it gets removed from the Endangered Species List, and all recovery efforts are ended. The second resolution calls for a removal of red wolves from private property. 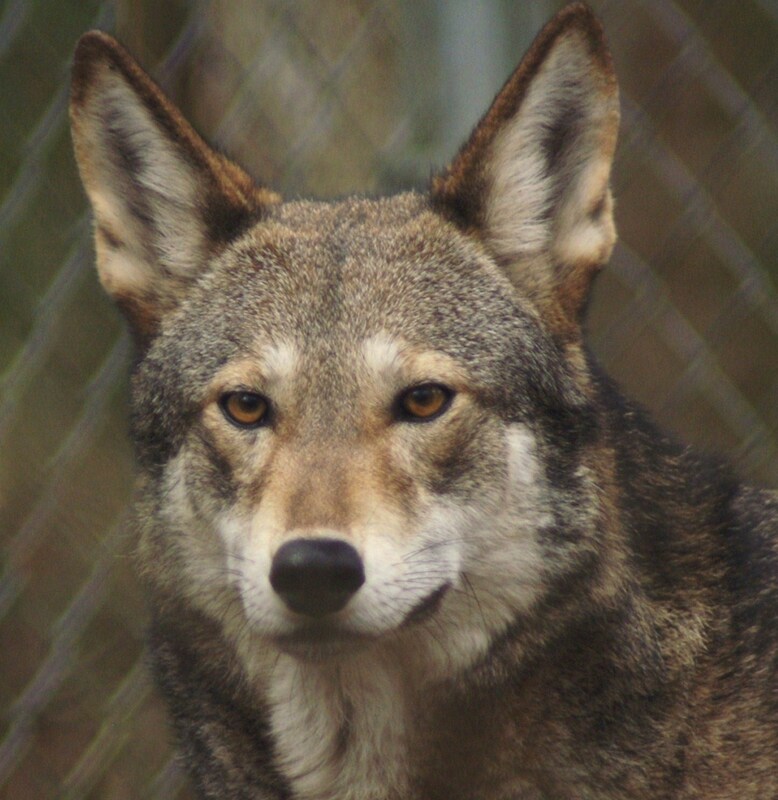 In the 90’s and the first decade of this century, the red wolf recovery program in North Carolina was celebrated as a successful wolf reintroduction in the East. These wolves lived in area where most confined livestock and poultry operations and crops comprised the main agricultural concerns. Very few opportunities existed for red wolves to cause problems with people. But now that coyote hunting is gaining in popularity in the state, the red wolves finally hit snag. Of course, the Fish and Wildlife Service could only maintain the supposed purity of the red wolves running loose in North Carolina though an intense trapping program. The population of canids called red wolves today derive from only 14 individuals, and as we know that most wild canids have a strong inbreeding avoidance instinct, red wolves will readily cross with coyotes. After all, red wolves are mostly coyote in ancestry, and those 14 were all derived from a population of coyotes and wolves that were running together in Louisiana and East Texas. In Peter Steinhart’s The Company of Wolves, the author recounts a government trapper in Louisiana who kept encountering litters of coyotes, where one pup would mature at 75 pounds, while another would top out at 25. This strongly suggests that the red wolf that exists now was a hybrid. There were some rather primitive genetic tests done on these wolves, but these were quite unlike the vonHoldt paper. What likely happened was that as wolves in Texas and Louisiana became rarer, they began to mate with coyotes. Because this wolf held on longer than in other parts of the South, there were more hybrids with wolf-like features that were then declared a species. There was some dodgy paleontology work that connected these wolves with primitive wolf-like canids from North America. They found some unique biochemical and molecular evidence in the 14 wolves, and based on the dodgy paleontology, the primitive biochemical and molecular evidence, and the phenotype, they declared these animals to be a species. I haven’t seen anything that any researcher has produced that falsifies the vonHoldt paper, which is the most extensive analysis of wolf and coyote genomes performed to date. Now, I am a big supporter of the Endangered Species Act. I am also a supporter of wolf recovery programs, but I’ve come to think that this particular program is quite problematic. The taxonomic value of the creatures we are currently calling red wolves is dubious at best. I’m open to some good evidence that contradicts the genome-wide study I linked to earlier, but I haven’t seen it. All I’ve seen is a critique of that study, which basically says you can’t use SNP’s to determine evolutionary relationships, but SNP’s look at much more of the genome than microsatellite clustering and mitochondrial DNA do– which all that the red wolf researchers have. Also the big critique on the red wolves are hybrids study I’ve seen is they didn’t sample enough red wolves. The problem with that argument is when a population derives from only 14 individuals, you really don’t need a huge sample to get an idea of what they are. This is one of those cases where I think the best science is on the side of delisting the red wolf. And let’s worry about Mexican wolves. Or maybe the diamond darter, a tiny fish that is now only found in the Elk River drainage of West Virginia. But that’s just a little fish, living in a state where economic interests that generally oppose clean water have long held sway over the political process. It’s not some ancient American wolf, which at one time was declared the root-stock of all wolves and coyotes. Wolves are great symbols of conservation. If left alone, they do recolonize their former range and often thrive. They are also closely related to domestic dogs. Indeed, dogs are derived from some Old World form of Canis lupus, and to the popular imagination, killing a wolf is like killing beloved pet dog. The wolf became sort of a “Fido as a Noble Savage,” which in itself is a pretty bad place for animal to be. So because this symbolism that having hard discussions about wolves is difficult. Protecting endangered species is more than raising hell whenever charismatic species might be threatened. It about preserving ecosystems and habitat, as well as all the unsexy little creatures, ones that will only gets nerds like me excited. I would hate for this red wolf fiasco to set a precedent that state wildlife agencies can just complain to the US Fish and Wildlife Service whenever a particular endangered species is causing them problems. The Western states have even more endangered species that are conflicting with state interests. For example, it was recently determined that the sage grouse of southeastern Utah and southwestern Colorado are a unique species, and what’s more, it’s actually an endangered species. In November of 2014, it was decided that this species of grouse, called the Gunnison grouse requires Endangered Species Act protections. The state of Colorado just sued Fish and Wildlife Service over the listing. Now, it’s unlikely that these grouse are going to be delisted because Colorado complained about them, but depending upon how the courts interpret the law, it could get interesting. Red wolves are just a bad case all around. The lesson to conservationists ought to be that if you want to save a species, you better make sure that there are no huge, gaping questions about its taxonomic status. I think the sad story here is that we’ve lost the Southern wolf, replacing it with wolves with a high amount of coyote ancestry, does not change this fact. 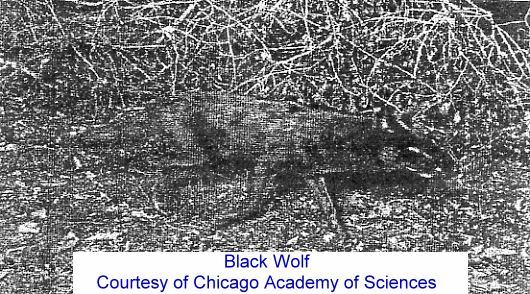 The Southern wolf is mentioned in the literature throughout region, and it was almost universally described as melanistic. Hat-tip to Sheila Collins for finding this photo. That wolf is gone. Perhaps it lives on the wolf genes of the modern hybrid red wolf, just as the Northeastern timber wolf (Canis lupus lycaon) lives on the “coywolves” the Mid-Atlantic and the Northeast. The thing about wolves, though, is they are coming back. Bit by bit. Some wolves have incorporated coyote blood, as is the case with the Algonquin Park wolves, and this hybridization even occurred before Western man arrived in this continent. The vonHoldt paper on wolf and coyote genomes showed that Great Lakes wolves hybridized with coyotes at some point 600-900 years ago. That means that wolves and coyotes, like modern humans and Neanderthals and Denisovans, exchanged genes with each other. Our popular understanding of evolution is that a species origination is one monophyletic population becoming genetically distinct and then losing chemical interfertility with the ancestral population and the sister taxa. However, evolution also has sister taxa exchanging genes a lot more often than we generally assumed. Wolf and coyote hybridization in North America has actually been underestimated as a driving force for the evolution for both species. We know that wolf genes have given Eastern coyotes an advantage when it comes to hunting deer and has likely enhanced their spread into the white-tail woods. When wolves came into this continent from Eurasia, they came into land full of coyotes. It is possible that they exchanged genes then, but there is no record for it. Or maybe those early hybrid populations became extinct. What we do know that is that hybridization occurred without the influence of Western Civilization and its attendant philosophy of wolf persecution, and in the case of some wolf populations, coyote genes could be a source of genetic rescue. So the wolf that will come back won’t be exactly like the one that was extirpated. It will have genes from coyotes and probably domestic dogs. And we should just accept it. After all, no one says that we should kill all the black wolves, even though that black coloration came from crossing with domestic dogs. The wolf that comes back will be in a world where there aren’t as many elk or moose to hunt, but there will be plenty of white-tailed deer and raccoons. This wolf will have to be adapted to hunting this quarry, and it will have to be as wary as a the most paranoid of coyotes in order to survive in this new New World. This is the approach that should have been used to restore wolves to the Lower 48. It avoids all the crazy debates about taxonomy, and it recognizes that ecosystems have been changed profoundly since 1492. So if North Carolina succeeds in ending the red wolf program, maybe it will be a chance to go forward towards a twenty-first century wolf conservation ethic. That’s certainly what would be best for the wolves, for wolves have to fit into our world now. They can do it, but we can’t get them there if we hold onto old ways of thinking. A few nights ago, during a snowstorm, my dogs started going nuts & I heard the wild caroling of a pack of coyotes up the draw by my bedroom. They were very close by; probably on a little flat between my house and the gas well back on the hill. It was just amazing, listening to them laugh and sing up there with the snow flying all around. Well, it is mating season :). Hey Scottie, you did a article on the NGSD awhile back didn’t you? I’ve got some more info on that if you’d like. Sure. My e-mail is retrieverman1(at)yahoo.com. According to this paper, coyotes were bigger during the ice age too. It makes me wonder whether the historical red wolf was only ever an overgrown coyote in the first place, perhaps with introgression of C. lupus or C. dirus genes. I am also thinking those extinct southern black wolves may have been some kind of Indian dog x red wolf (or coyote) hybrid that became established in southern states in pre-Columbian times. ….and full of Canis dirus. I wonder what the dire wolf genome will tell us if it is ever sequenced. It long ago occurred to me that sacrificing black wolves may be a prudent thing to do as wolf numbers increase and the political pressure to control wolf numbers increases along with them. The problem is that when you look at historical “red wolves” not all them look like large coyotes. Audubon and Bachmann were very clear that the red-colored wolf of Texas was just a color phase. There is no mention of them having larger ears. I don’t know if there is any dire wolf in any extant wolf or dog populations. All black wolves have some amount of dog ancestry, but it usually not overwhelming. I think we just lost our subtropical American wolf, which was either melanistic or reddish sable. Those wolves from Louisiana in the 1930’s look like Romeo the famous black wolf, just with a shorter coat. They were probably smaller, but I don’t see any real dog-like features. It looks like a very robust black wolf, just with much shorter fur than you would see in most photographs. I am not sure how reliable ear size and coat length are in distinguishing the difference between truely wild melanistic wolves and some sort of stable hybrid population with some dog ancestry. Look at the pics of the pages you linked to in your more recent post about golden jackals in Belarus and Ukraine. Some golden jackals have ears twice the size of other golden jackals. I had two Dobermanns over the years, both from the same breeder. Dobe2’s ears were a good inch longer that Dobe1’s. One of the nicknames my wife and I had for Dobe2 was “coonhound”, (as in the black and tan coonhound). Ear cropping is illegal where I live so both had natural drop eras. Dobe1 also had quite scratchy hair when petted against the grain. I think he may have had the wire hair gene expressed in him but masked by the gene for short hair. Dobe2’s coat was softer and a little longer, more like a Rottweiler’s. Dire wolf genomes have never been sequenced, as it would be difficult and is not high priority. As far as I know, there aren’t even mtDNA sequences from them. I am puzzled by the lack of dire wolf mtDNA sequences. The mtDNA of bones thought to be early dogs have been sequenced. There are also mtDNA sequences of early Canis lupus though to have crossed the Siberian land bridge. So why no C. dirus mtDNA? As time goes on DNA technology will become more sophisticated and cheaper. Someone is bound to sequence C. dirus mtDNA sooner or later. Not a bad project for a doctoral student. There is a study on Eurasian cave lion, American lion, and modern lion mtDNA, which 1. proved that these animals were lions and 2. proved that you can get mtDNA from specimens that old. There is some debate about the exact taxonomy of dire wolves, but it could be answered with DNA study. If you kill the black wolves, then do you kill the gray ones that are their relatives? I’m not a big fan worrying about subspecies or purity of species, unless it’s something like a Mexican wolf, which is clearly a distinct subspecies with its own niche. Recessive genes are notoriously difficult to cull out completely so there will always be some gray wolves carrying the gene for black. Personally I would not kill the gray relatives of the black wolves but I think ranchers and disgruntled deer hunters who find getting their trophy on a weekend hunt becoming more difficult are going to shoot, poison, or trap wolves anyway irrespective of color. There probably isn’t a species in the world that exists in sizable numbers that doesn’t have a few recessive color mutations in the population that could appear at any time given the right mating. Therefore it is not the color morph for black itself that I have reservations about, rather it is the other genes closely linked the the black gene on the chromosome. Are those linked genes wild type genes found in wolves anyway? Are they mutant genes exclusive to dogs and contribute to doggishness vs wolfishness? Are they nothing more than neutral marker genes that have no significant effect on the phenotype? How many dog genes are needed before the wolf is no longer a wolf? Look at it this way. If someone crossed a golden retriever to a Rottweiler and then bred the crossbreds back to golden retrievers for several generations. How many generations would it take before you could once again call the pups golden retrievers? For one thing, they’re not recessive blacks. The black wolves of North America are dominant black. The answer to your last question with purity of dog breeds is 4 generations. That’s about how long it takes. Ok, black coat color in wolves is dominant. So there really isn’t a problem. Hmm, why would you ask about killing gray wolves that are their relatives? The gray wolf relatives of the blacks would be a non-issue for even the most ardent purists.